Alyssa Pearson’s interest in film began at a young age. Sometimes a lifestyle shift comes slowly over time, but for Jeffrey Hoehn it emerged from a moment of frustration and inspiration. Malone University and Plain Township Parks launched a pilot academic program for preschoolers facilitated by teacher candidates from Malone’s early childhood education track under the guidance of Chanda Coblentz, instructor of education. A $4,500 grant from the Charles G. Koch Foundation has afforded Assistant Professor of Political Science David Beer the opportunity to enhance learning experiences for a number of students at Malone University. Jason ’02 and Suzi (Jeren) Lantz ’00 challenged students in Community Worship to make the most of their opportunities at Malone, to engage the Church, and to figure out their identity in Christ—and their roles in the Kingdom. 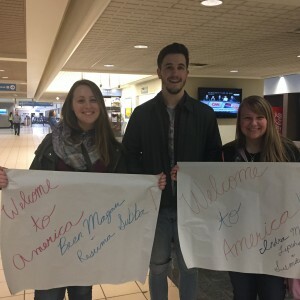 Following the command to "love your neighbor as yourself," several Malone students welcomed refugees at the airport. Malone alumna finds success -- and love! Alumna SaraBelle Hawkins ’10, ‘12 was named co-owner of Atomic Dice Studio Arts in December. When life hands you honeycomb... make lip balm? At least that is the case for Malone alumni Matt '04 and Laura Carmany '06. Their small business, The Wholesome Hive, combines his passion for beekeeping with her entrepreneurial spirit. The Center for Study and Testing (CST) in Regula Hall is a place for nursing students to study, collaborate, network, watch DVDs for classes, and receive tutoring. Cassie Hunt ’14, a Community and Public Health Promotion graduate, is serving with Federal Emergency Management Agency (FEMA) Corps, a subdivision of AmeriCorps. AmeriCorps helps communities in the United States prepare for and recover from hazards.